Callwood, June. "Marilyn Bell". The Canadian Encyclopedia, 04 March 2015, Historica Canada. https://www.thecanadianencyclopedia.ca/en/article/bell-marilyn. Accessed 23 April 2019. Later she became the youngest person ever to swim the English Channel and the Str of Juan de Fuca, but nothing could match the euphoria that gripped the waiting crowd in Toronto when she weakly touched the wall 20 hours and 59 minutes after setting out. 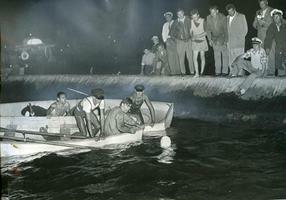 Marilyn Bell completed her swim across Lake Ontario when she touched the breakwaters at Sunnyside Beach near the CNE, September 9, 1954 (courtesy Canada's Sports Hall of Fame/X981.32.1.52). 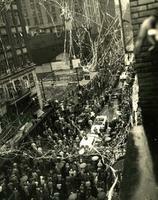 Toronto honoured Marilyn Bell with a ticker tape parade down Bay Street days after her swim in September 1954 (courtesy Canada's Sports Hall of Fame/X981.32.1.46). Bell was 16 years old when she waded into chilly Lake Ontario and swam 51.5 km from Youngstown, NY, to Toronto's western shore, a feat that caught the nation's imagination (courtesy Canada's Sports Hall of Fame). 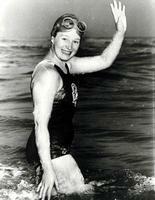 Marilyn Bell, swimmer (b at Toronto 19 Nov 1937). When she was 16 years old, Bell waded into Lk Ontario on the chilly night of 8 Sept 1954 and swam 32 miles (51.5 km) from Youngstown, NY, to a slimy breakwater off Toronto's western shore, a feat that caught the imagination of the country. A war between The Toronto Star and The Toronto Telegram reporters who covered the event came to real blows while Bell was in the water fighting lamprey eels and choking on oil spills. Gus Ryder, her coach, was forgiven for refusing to pull her out even when she seemed semiconscious. Later she became the youngest person ever to swim the English Channel and the Str of Juan de Fuca, but nothing could match the euphoria that gripped the waiting crowd in Toronto when she weakly touched the wall 20 hours and 59 minutes after setting out. It was said to be a quintessential Canadian achievement: an individual, grim and steadfast, who was not defeated by the elements. 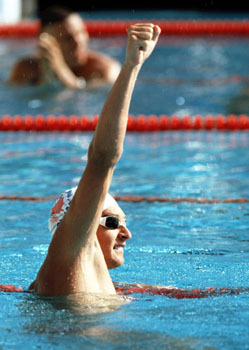 Many people later equalled her exploit and more in faster times as marathon swimmers plunged into a mania for lake crossing, but none ever equalled the moment of glory that Bell achieved in what became the high point of the decade. To the joy of the public, who showered gifts and praise on her, she was a model hero - modest, intelligent, appreciative and charming. She left the spotlight as abruptly as she had entered it, her halo intact.